I’ve always seen recipes for hummingbird cake, but have never quite figured out exactly what it actually is. A cake with bananas, pecans, pineapple – surely it just seems bizarre! Like it’ll just be a big lumpy mess of cake! I never really understood the appeal, but decided to give it a shot after I saw this recipe on the cover of Southern Living. This cake in particular has a cream cheese custard filling and what’s supposed to be browned butter frosting. But I chickened out in the middle of browning my butter – I didn’t want it to burn! Despite my skepticism, this cake turned out pretty well! It was a big hit at work, so there must be something magical about the strange combination of ingredients. 1. The night before, make your cream cheese filling. Whisk together first 2 ingredients in a heavy saucepan, then whisk in eggs and milk until smooth. Cook over medium heat, whisking constantly, 8 to 10 minutes or until mixture reaches a chilled pudding-like thickness. Bring to a boil, whisking constantly, and allow to boil for 1 minute. Remove from heat, and whisk in cream cheese and vanilla until cheese melts. Cool to room temperature (about 1 hour). Place plastic wrap directly on mixture (to prevent a film from forming), and chill 6 to 24 hours. 2. The next day, make your cake.Prepare 4 9-inch round cake tins by greasing and lining the bottom with baking paper. Preheat your oven to 350°F (175°C). Mix all of your dry ingredients together, then add in the rest of the ingredients to create a moist batter. 3. Bake for 20-25 minutes or until your cake tester comes out clean. Remove from the oven and allow to cool on a wire rack for 10 minutes, then remove the layers from their pans and allow them to cool completely. 4. 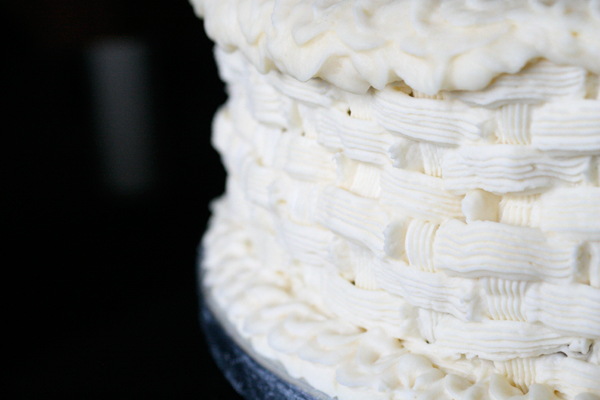 Put together your cake layers by spreading a portion of the cream cheese custard in between each layer. Cover your cake with plastic wrap and place in the fridge to cool while you make your frosting. 5. Finally, make your frosting. Cook butter in a small heavy saucepan over medium heat, stirring constantly, 8 to 10 minutes or until butter begins to turn golden brown. (This is the part where I chickened out!) Remove pan immediately from heat, and pour butter into a small bowl. Cover and chill 1 hour or until butter is cool and begins to solidify. 6. Beat butter at medium speed with an electric mixer until fluffy; gradually add sugar alternately with milk, beginning and ending with sugar. Beat at low speed until well blended after each addition. Stir in vanilla. 7. Once your frosting is finished, frost your cake. The frosting on my cake is called a basketweave. To do this, you’ll need A LOT of frosting, so you’ll want to double the recipe to make sure you have plenty to get the job done!